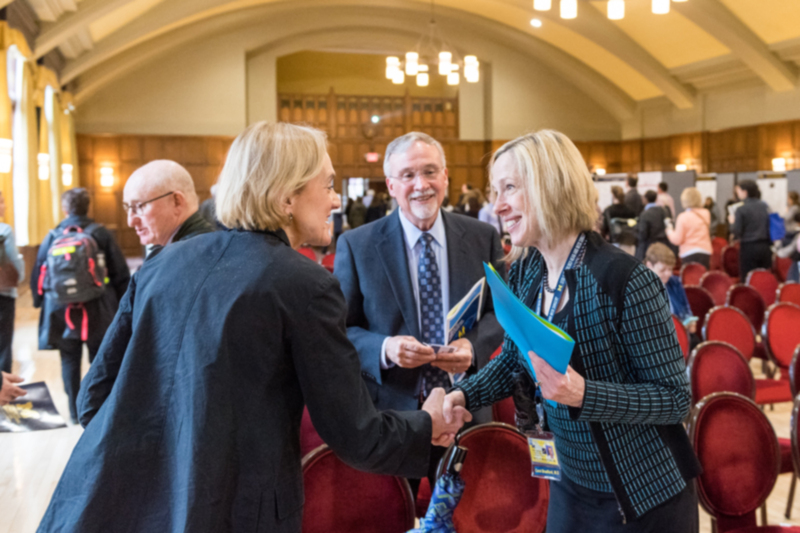 Carol Bradford, M.D., right, was one of many medical school representatives at U-M Health Professions Education Day held earlier this month. For four years running, the U-M Health Professions Education (HPE) Day has been a unique event showcasing health education, research, practice and collaborative projects. 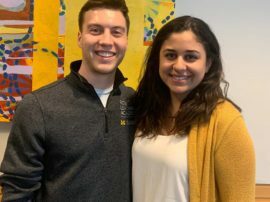 It annually sparks interprofessional collaboration, networking and inspiration across the ten health professions schools on U-M’s campuses in Ann Arbor, Flint and Dearborn. 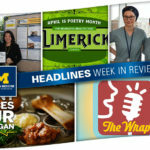 The 2018 HPE Day, which was held at the Michigan League earlier this month, featured 68 poster presentations, the majority of which focused on interprofessional education (IPE) and care (IPC). Many project teams spanned across roles, with an unprecedented number of students joining faculty and health professionals in presenting. The 227 HPE Day participants came from multiple offices and institutions across the state and included 67 students. 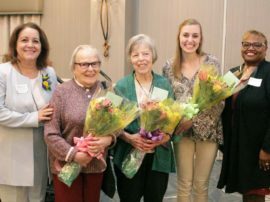 The three past and current cohorts of the U-M Interprofessional Leadership (IPL) Fellows were also well represented. 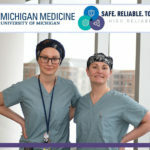 Approximately a quarter of the posters represented work by teams consisting fully or partly of the IPL fellows, who are faculty from U-M who participate in an 18-month program to become change agents for interprofessional education and practice. Ribbons indicated the IPL posters, and the fellows had opportunities during the day and at lunch to exchange ideas. Welcoming participants and introducing the plenary part of the day was HPE Day co-chair Caren Stalburg, associate professor of obstetrics and gynecology, division chief of professional education in the Department of Learning Health Sciences (also chair of the faculty development committee of the Michigan Center for Interprofessional Education). 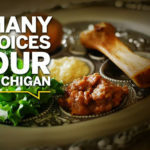 “As a proud graduate of the U-M Medical School, it’s always impressive to see how we all shape one another and how we all guide one another in our journeys,” she said. Stalburg introduced Carol Bradford, M.D., executive vice dean for academic affairs at the U-M Medical School. Bradford introduced the endowed lectureship in honor of James O. Woolliscroft and his contributions and legacy at U-M.
University of California-San Francisco professor of medicine Molly Cooke delivered the Inaugural James O. Woolliscroft Lecture on “How Much Difference Can One Teacher Make?” Her talk recapped “the really quite remarkable” academic career of Woolliscroft, a former U-M Medical School professor and dean. She focused on milestones of his expansive scholarship in medical education, especially with diagnostic reasoning and clinical decision-making, noting she found him listed as first or last author on 45 health education articles in PubMed. Woolliscroft was on hand throughout the day, perusing posters and talking with students, faculty and other attendees. “It’s an incredible time to be involved in health professions education,” he said.